I just got my 2016 (events of 2015) yearbook for my 1967 set ... the set was $125 if I remember correctly, this year's book was $50 ... haven't missed one yet though I haven't unwrapped the annual since the late 90's. White, green and gold, just like the picture. 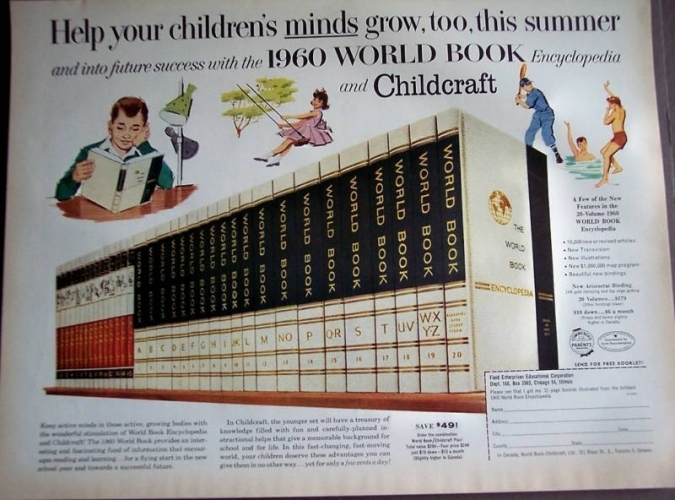 I ran into a saleswoman for World Book Encyclopedia back in 1975, we ended up purchasing the Yearbook and Science Year up to 1998 before we quit buying them. Maybe I should check on Ebay to get them current. We had these when I was growing up in rural SK. They were very many hours of good reading. Bob - By the time we got our set (1961, I think, 'cause I was also in 5th grade), there was also a blue option, and that's what we got. But the annual "yearbook" was only available in white. In 1957 my mother let the salesman with his samples into our apartment. They looked so good and were so understandable to this fifth grader that I was excited at the prospect of actually having all twenty volumes in the house! (The last volume was an "Index" to the other nineteen). The big decision was whether to go with the premium white covers (pictured) or less expensive red covers. I wanted the beautiful whites but Mom (sensibly) chose the latter. But we did purchase the optional white wood book "shelf" to hold the entire set. The annual updates were exciting to receive. This 1958 edition we bought took me all the way through High School graduation. It was only about 5 years ago that I finally bid them all a fond farewell. The part of World Book I loved (we had our own at home) was the Year Book that would be published annually (of course!) to keep the encyclopedia updated. You got a set of gummed stickers that you would put on the appropriate page of the World Book, telling you that there was new information in the Year X Year Book under that topic. In the 60s, our volume S had at least 5 stickers under "space travel." My school library had several encyclopedias, but I always preferred the World Book. It was some combination of the writing style, type font, color and feel of the paper... I dunno. We had a set at home, too; I think I had procrastinated on a big 5th-grade project, and we had to buy an encyclopedia so I could do the necessary research. That was in 1961, I think, and we purchased the annual supplements for several years after that.